Wow! Who would have thought that a blog that I started almost 3 years ago would still be around? Not me for sure. I must admit that I have a habit of jumping into things and then a few months later leave it by the wayside. Not blogging though. 1,000 posts later I'm still here and loving every minute. This would probably be a great time to write a thought provoking post sharing my reflections on blogging and how it has impacted my life over the last three years, but if you are regular reader you know that thought provoking posts aren't really my style, not to mention that today is my first day of summer vacation so no thinking allowed (yes, I realize that is one heck of a run on sentence. Didn't you just read that this teacher is on summer vacation so grammatically correct sentences no longer apply?). BLOG ON, People, BLOG ON! Oh and I was thinking, wouldn't it be sweet to have 1,000 comments on your 1,000th post? So what are you waiting for, say hi, congratulate me for sticking with something for so long, tell me why you are here, ask me about the weather, anything...I'd love to hear from you. 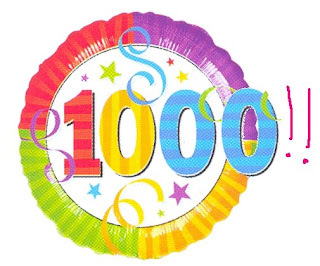 I know you are there, my stat counter tells me so, so come on celebrate my 1,000th post by giving me the best blogging present ever...COMMENTS!! Congrats and Happy 1000th Post!! Such an accomplishment! WOW - that is awesome. Happy 1000'th day post to you (you know the rest) ... AND enjoy your first day off from school!! Congrats on 1000 posts! Hope the weather clears up for your first day of summer vacation! How did you make it 3 years with multiple posts almost every day? You are wonderful and i hope you get your 1000 comments! woooohoooo! congrats on hitting 1,000!!! Mel I will help you get to 1000! Congrats on 1000 posts! Mel, you are one of the nicest and most lovely women I have had the chance to get to know online. Here I am- number 14! Happy 1000! I'll help you out in the comments department :) Congrats on the 1000th post! oh well! I hope you can get at least 100. HOLY WOW!! 1000 posts is pretty amazing!! when my blog grows up I hope it is just like yours!! Congratulations!! That's an amazing accomplishment. Keep the posts coming... I've enjoyed getting to know you! just found your blog, thanks to @bwjen on twitter! Congrats on your 1,000th post! I'll be reading you from now on. Love it! Oh my that is a lot of posts. Congrats on 1,000! Happy summer to ya. You go girl! Here's to 1000 more!! Congrats! YAY! Congrats to you on 1000 posts! Congrats on the 1000th post!!!! Have a great summer vacation! I have to let you know that you inspired me to start running. I am currently on week 3 of the couch to 5k plan. I'll be running 5ks before I know it! Great to have made it this long in this virtual world of come and goes...love reading your blog! Quite the accomplishment. Happy 1000 to you! 1,000 is a lot of posts!!! Congrats!! hOpe your summer is off to a good start! That's what you get for posting multiple times per day or at least once per weekday. But I love reading every word. Congratulations and may you never lose that bloggy groove that got you to 1000! Congrats! I'm getting close to there myself. Congratulations. I just found your blog, and I look forward to read more. I heard about it because of your walking. I am a teacher too, and I keep on trying to get into a regular walking routine! This message brought to you by the Abacus. The Abacus is your friend. Nothing to see here. Move along. This message also brought to you by the Illumninati. That is amazing! I am almost to 150, but maybe someday I, too, will hit 1000. Happy 1st day of vacation, too! Congrats on the 1,000th post. Congrats thats a lot of posts! Oooo...I have to help you get to 1000 comments on your 1000th blog post!! The blogosphere is a wonderful place. I'm so glad you're a part of it. Hooray for your 1000th post! Good work! Holy cow! 1000 posts? And I thought I was a big shot for having 100! CONGRATS!! Way to go! That's an awesome achievment. Now go out and enjoy every minute of your summer vacation.